Huber, a native of Gainesville, Florida, will pursue the M.Phil. degree in veterinary science in Cambridge’s Department of Veterinary Medicine. During his undergraduate studies, he developed a strong passion for infectious disease research, which he considers the intersection of his interests in global health, mathematics and social justice. To date, his research has focused on constructing mathematical models for the transmission of mosquito-borne pathogens, principally malaria and dengue. He has conducted his research under the guidance of Alex Perkins, Notre Dame’s Eck Family Assistant Professor of Biological Sciences, and Erin Mordecai, an assistant professor of biology at Stanford University. 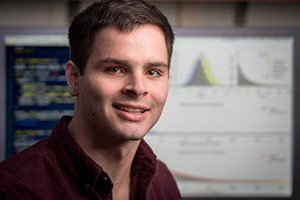 His most recent research project, which was published in Malaria Journal, focused on quantifying serial and generation intervals, important epidemiological metrics, for Plasmodium falciparum malaria.